As a billing and coding service, MBR features a host of programs designed to make us stand out within the healthcare billing industry. These programs have been designed to work together to accelerate your cash flow. Separately, each has an impact, but when implemented together they can have a significant positive impact on your balance sheet. You can send charges to us by paper document, scan and transmit electronically, use a charge capture system, or send them through an EMR system interface. The point is the faster we have the charge and can transmit the claim, the faster you are reimbursed and the better your cash flow. Claim Scrubbers: are programs that review claims before transmitting to payers to ensure claims follow every specific guideline. We scrub claims before the initial submission to minimize rejections that typically happen much later in the process from payers, causing reimbursement delays. Fewer rejections and edits cause faster cash flow. Online Bill Pay: Patient portals, Online Bill Pay, or Patient Exchanges are different names for the same service. Our online bill payment service enables our clients to accept payments from their patients 24 hours a day, 7 days a week. Portals offer patients a safe, secure and convenient method to pay their bills. These websites are personalized with your own branding. Our portal accepts credit and debit cards, personal checks, and allows for automatic recurring payment plans. Portals are secure and encrypted, and payments rely on electronic funds transfers, which means that payment is available to you faster and with fewer errors. 42% of all online payments are received after business hours or on weekends. Industry standards claim that online bill pay can reduce A/R by 35%! Our service reduces the cost associated with patient statements in both volume and postage. Since the internet is a preferred method of payment for many individuals, why should a patient be confined to paying their bill during normal business hours? Better yet, why wouldn’t a practice want to accept payments all day, every day? EMR’s: We interface with a variety of EMR’s in many different ways. We can work with any EMR with a HL7 interface. Rapid Capture of Charges: Scan and electronically send your documents (free scanner), use our charge capture system, or download charges from your EMR system. Basically, the faster we can receive the billing, the faster we can transmit, and the faster you’re paid. But we do still offer a courier for those offices that prefer this tried and true method. Advanced Scheduling Program: Our scheduling program is an easy-to-use, full-featured, web-based program that can be accessed from anywhere. 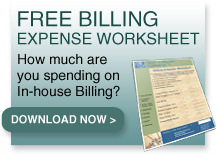 Through this program anyone can customize a billing slip for your practice needs. Through the scheduling program we can run reports that indicate missing billing for patients that have been seen. 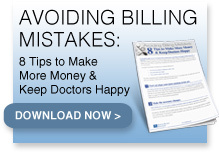 No more lost billing – no more lost reimbursements. Customized Encounter Forms: For many practices we design an encounter form to meet your specific needs. Each practice is different with unique needs, and we design a bar coded billing slip for you that is then scanned and electronically sent directly into our work flow process. Patient Eligibility Verification: Never again wonder whether a patient is covered when you have real time patient eligibility lookups at your front desk. 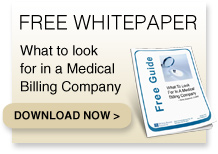 Collect accurate co-pays at the time of service and reduce patient accounts receivable. With the current economic slow down across the nation, patient bad debt is on the rise. Patient Balance Inquiries: Look up a patient’s previous balance to be collected at the next time of service. If a patient has a previous balance, we can show you how to collect it while the patient is in the office for a scheduled appointment. This increases cash flow and reduces patient statements. As you can see, we have designed real life applications that work in practices every day. 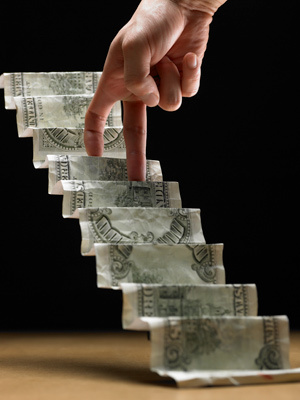 Every program is designed to accelerate cash flow and reduce costs. So call us today to see how implementing these programs in your practice can improve your cash flow and increase your monthly revenue.